Diet, exercise and sleep are key to good health and the prevention of disease. The health of your gut is inextricably linked to the quality of your diet, which impacts on digestion. Besides this, research is beginning to identify how your gut may also be linked to immunity, sleep, mental health (stress, depression) and obesity, all of which can affect your health in a multitude of ways (1). The initiative, ‘Love Your Gut Week’, starts on the 17thSeptember (2018) and highlights the importance of our digestive system to good health. The term ‘microbiome’ refers to the collection of around 100 trillion microbes that live in and on our body, most of which are found in the gut. An army of microbes (including bacteria) colonise the body even before we’re born to form a protective barrier that defends against foreign invaders harmful to our health. Your microbiome is unique like a fingerprint reacting to the world both around and within you. The microbes you cultivate make up the unique diversity of your microbiome. 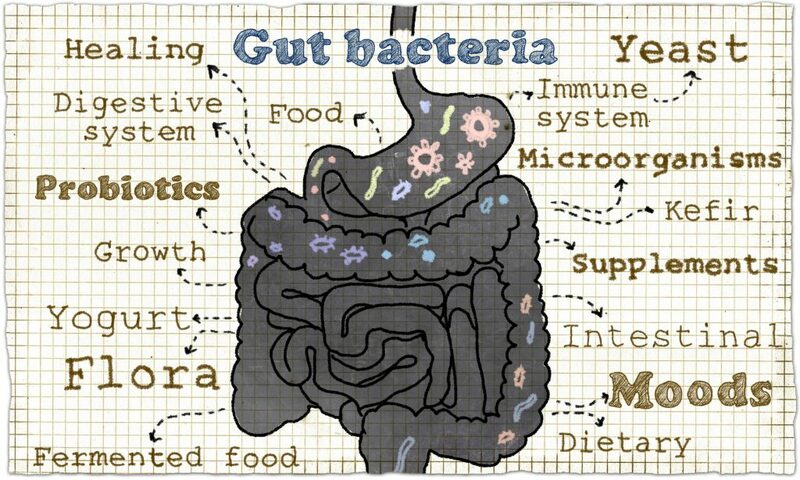 The bacteria in your gut help maintain the efficiency of your digestive system. These bacteria also help to synthesise vitamin D, K, B12, folic acid and thiamine as well as assisting in the digestion of polyphenol compounds shown to protect the body against disease. Gut bacteria also produce short chain fatty acids that supply energy to the cells of your colon and have been shown to play a key role in the maintenance of health and prevention of disease (2). What can impact on the ‘health’ of your microbiome? Diet and lifestyle choices can impact on the diversity of bacteria found in your gut. The ‘typical’ Western diet is characterised by an overconsumption of foods high in ‘added sugars’ and ‘bad’ fats. The impact of overeating and a lack of exercise has led to an overweight nation although the complexities of weight management are not as simple as calories in and calories out. Being overweight is a risk factor for many diseases and the physiological effects it triggers such as inflammation are now widely recognised as being a contributory factor. It’s often suggested that a diet overloaded with sugar and ‘bad’ fats encourages the growth of bad bacteria, but these effects don’t seem to be that clear cut. Another more straightforward explanation is that people who eat an unhealthy diet are less likely to eat the foods that support an environment that allows good bacteria to thrive such as vegetables, wholegrains and other high-fibre foods. Whilst the overall quality of your diet can impact on the health of your gut, certain foods have been shown to be particularly beneficial in supporting the diversity of bacteria that live there. Lifestyle factors and the use of medication have also been shown to impact on your microbiome. Stress is fast becoming a common side-effect of our modern lifestyle. We all experience stress, sometimes on a daily basis, but the effects are usually short lived. Problems can arise when stress becomes chronic, not only impacting on mental health but triggering inflammation within the body (3). Stress can also increase the demand for certain nutrients such as the B vitamins and magnesium as well as influencing food choices that can result in a failure of the diet to provide everything the body needs. Feeling ‘butterflies’ in your stomach or nausea are common symptoms of stress and illustrate how the brain is closely linked to the gut. Sadness, happiness and anger are a few examples of the emotions that can affect the gastrointestinal (GI) tract, which is sensitive to such emotions. In some cases, psychology combines with physical factors to cause pain and bowel symptoms that characterise conditions such as irritable bowel syndrome (4). Psychosocial factors such as stress can influence the actual physiology of the gut, affecting movement and contractions of the GI tract, increasing inflammation and even making you more perceptible to infection (5). Don’t dismiss the impact stress has on the body. Addressing your mental health is just as important as the food you eat, exercise you take and sleep you get, all of which are intertwined. Try exploring techniques such as meditation that has been proven to help with stress. There are many apps available that can help to teach you this practice. Certain fibres in foods are indigestible and commonly referred to as prebiotics. Gut bacteria feed of these fibres, helping them to flourish and process by which they break them down (fermentation), produces short chain fatty acids. Onions, garlic, leeks, asparagus and bananas contain inulin and fructooligosaccharides that act as prebiotics. Oats and barley contain beta-glucans that act as prebiotics. Starchy foods such as pasta, rice and potatoes form resistant starches (resistant to digestive enzymes) once they’ve been cooked and then cooled. Resistant starches act as prebiotics. Many people rely on the long-term use of medication to help manage the symptoms of their health condition. Aspirin and ibuprofen are types of Nonsteroidal Anti-inflammatory Drugs (NSAIDS) commonly used to treat inflammatory conditions such as rheumatoid arthritis, but these drugs have been shown to reduce levels of good bacteria in the gut (7). Other medications such as antibiotics are prescribed as a short course to support the body’s ability to fight infection. These drugs are not a friend of gut bacteria as they can wipe out swathes of both good and bad. In certain cases, such as severe bacterial infections, they’re required to help the body recover but are of no use in fighting viral infections such as colds or flu. Using probiotics alongside certain medications such as NSAIDS or after a course of antibiotics can help to re-balance your microbiome. Another interesting issue surrounding antibiotics is their extensive use in the farming of food animals. The issue is a topic of debate but eating less meat and choosing better quality meat may not only be better for your health but reduce the transmission of antibiotics through the food chain. Strains of bacteria that have been shown to have a positive health benefit are referred to as probiotics. Bacteria from the Lactobacillus and Bifidobacterium family are some of the most widely researched strains. One of the most common probiotic foods is live yoghurt, which contains strains such as Lactobacillus Acidophilus and Lactobacillus Casei. These strains are also found in yoghurt ‘shot’ drinks that have become very popular. When you’re choosing live yoghurt or yoghurt products try opting for those that are low in sugar. Fermented foods such as kimchi, kefir and miso also contain strains of bacteria that can support good gut health. These foods are now widely available in most supermarkets. Probiotic supplements offer a way of delivering large doses of specific bacteria to the gut. Stick to preparations that contain well researched strains such as Lactobacillus and Bifidobacterium in a dose of at least 10 billion bacteria per serving. To help with their transit to the gut, avoid taking with hot food and drinks or alcohol that can destroy them. As the research linking gut bacteria to health and disease outcomes evolves, so does the potential role of probiotics supplements. Their use and efficacy have recently come under scrutiny, but there’s still plenty of good quality research that points towards their beneficial role in health. Bacterial strains such as Lactobacillus Rhamnosus and Lactobacillus Casei have been widely researched for their ability to prevent and reduce the severity of diarrhoea. Research published in the Journal of the American Medical Association showed that taking probiotics helped reduce the risk of diarrhoea associated with antibiotic use by 42% (8). Further research published in the Lancet showed that probiotics helped to reduce the risk of travellers’ diarrhoea by 8% and from all other causes in adults by 26% (9). The cells found in the gut are thought to make up almost 70% of the entire immune system, so it makes sense that it’s inextricably linked to immunity. Research has shown how probiotic supplements containing certain strains can promote the production of antibodies. The same strains have also been shown to stimulate the activity of immune cells such as natural killer cells and T-lymphocytes that help to regulate immune responses. Research has shown how probiotic supplements may prove beneficial for upper respiratory tract infections such as colds, coughs and flu. Research published in the British Medical Journal found that children who regularly took probiotics (Lactobacillus GG) had 19% fewer infectious diseases over three months compared with those that didn’t (10). This is new area of research and the question of whether obesity is linked to gut bacteria is not yet answered. Data suggests that the composition of bacteria in the gut differs between people who are obese and those that are lean (11). It’s also been shown that the typical Western-style diet rich in fat and refined carbohydrates may even increase the strains of bacteria linked to obesity (12). Research has provided several potential reasons why the diversity of bacteria in the gut may be linked to obesity. Certain bacteria are involved in the digestion of carbohydrates and fats (13), whilst others have the potential to increase inflammation in the body (14). Other may impact on the production of hormones that influence appetite (15). Whilst in its early stage, this research highlights the future potential for probiotic supplements as part of personalised nutrition guidance to help in the fight against obesity. The bacteria in your gut play a role in health that’s essential to life. New research not only helps to confirm this but is exploring the many benefits that go beyond digestion. Diet and lifestyle can both influence the diversity of bacteria in your gut and this can have a negative impact on your health. Following a healthy balanced diet will help to maintain the health of your gut and the bacteria that reside in it as will addressing lifestyle factors such as stress. Research into the use of probiotic supplements is ever evolving but they can provide a useful way to help maintain the balance of bacteria in your gut. Maintain a balanced diet and try to avoid foods high in sugar and ‘bad’ fats. Eat wide variety of plant-foods such as vegetables, nuts, seeds and wholegrains that are high in fibre and support efficient digestion. Include prebiotic foods in your diet – onions, garlic, bananas, oats, barley. Include probiotic foods in your diet – live yoghurt, kimchi, kefir and miso. Use relaxation techniques to address the issue of stress. Factor the use of medication into your diet and the effect on gut bacteria. Take a probiotic supplement that includes strains such as Lactobacillus and Bifidobacterium in a dose of at least 10 billion bacteria. This entry was posted in Ingredients, Nutritious Delicious, On Diet, On Food, On Healthy Eating and tagged Bacteria, Diet, Digestion, Fibre, Gut health, Immunity, Microbiome, Nutrition, Nutritionist, Obesity, Prebiotics, Probiotics, Rob Hobson, supplements. Bookmark the permalink. Are you a sleep hijacker?